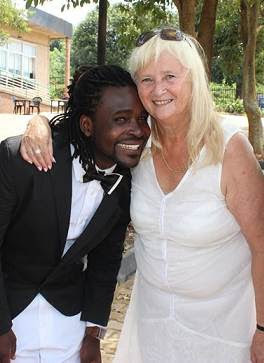 26 year old Ugandan singer, Guvnor Ace whose real name is Ronald Ssemawere made headlines yesterday in Uganda after he got married to his 68 year old Swedish lover, Mona Lisa Larsson at a marriage registry in Kampala, the Ugandan capital. According to Ugandan media, Guvnor had released two singles in her honor which he titled: Mona Lisa and Mukadde. In one of the songs, Guvnor sang "The one you call elderly, I discovered secrets in her and she gives me love to the fullest.